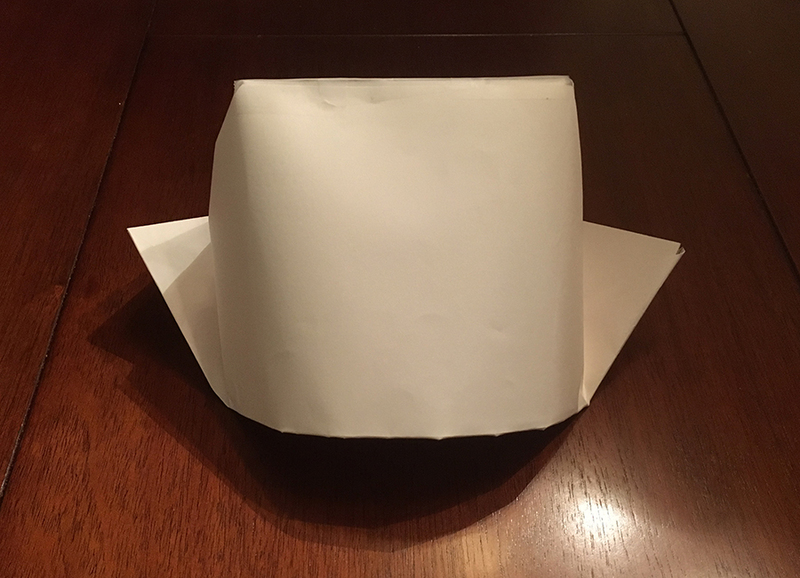 I made this Dutch hat for my daughter Sara more than 15 years ago, borrowed from an origami listserv. The lady who shared it was so kind to send me a diagram and description. Over the years it has been my most visited site, with visitors from all over the world. Cut the two sheets of paper to the size of 11″ x 16″ (28 x 40.7 cm) and tape both sheets together at the long (16″) ends with Scotch tape. Fold the paper together in the middle along the taped sides (dotted line) with the tape on the outside. Open the top of the folded halves back, so the fold appears as a vertical line in the middle (dotted line). Now fold all four corners at 45 degrees to that center fold. Each corner should be folded towards you as seen below at 4 (both the 3-double fold on the left corner and the single sheet corner on the right). Re-fold in half along the existing crease (dotted line) with the folded corners on the inside. There now is a ‘pocket’ on the longer (11″) side which will sit on the child’s head. The hat is almost done, you just need to fold both pointed edges upward as “wings” (see 6 and 7). Open the hat on one end of the “pocket” and flatten the pointed edge. Fold it 2 1/2″ back. Repeat at the other end. You now have a hat with “wings” on each side. Tape the top of the hat together with Scotch tape if you want a more tidy look.